Katy: The Potential to Power Symposium is one of my most treasured memories from senior year. It was such an incredible day! I got to catch up with my lovely SPARK sister Mehar and meet such inspiring women and girls from all over New York City. I also had the opportunity to speak on a panel alongside Allie Primak, a fellow girl activist, and Dr. Danielle Moss Lee, YWCA-NYC’s President. Allie and I shared how we became involved in feminist activism, what feminism means to us, and the issues we’ve witnessed and experienced. Dr. Lee prompted us with questions like “How can we encourage girls to stand up for one another?” and “Do you think there is a role for boys in advancing gender equity? If so what is that role?” Afterwards, audience members came up to the microphones to ask questions. One girl asked how to share feminism with her conservative parents. Another woman asked us if selfies empower girls or promote self-objectification. It was challenging and thrilling at the same time! Afterwards, there was a time when we sat with our assigned tables to discuss questions that we were given. The question “How can adult women better support girls?” was particularly interesting to me because as someone who is currently phasing out of girlhood and phasing into womanhood, I’m now learning how to support girls just as the adult women in my life have supported me. The two “influential women” at my table were Prim Siripipat, an ESPN anchor, and Reshma Saujani, the founder of Girls Who Code. Both were so gracious and eager to listen to our concerns and experiences. As women working in traditionally male-dominated fields, they had tons of advice and experiences to share with us. Our table had such fruitful and inspiring discussions that every time the MC called “Time!” we were really dismayed that we had to move on to another question so soon. I am so grateful to the YWCA for giving us girls a supportive environment to speak up about feminism when so often, people try to silence us. It was an honor to be invited as a panelist and I really look forward to supporting YWCA in the future. I can’t wait to see how the Potential to Power Symposium grows with each passing year! 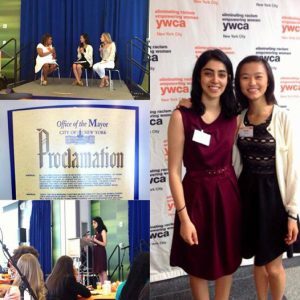 Mehar: Attending the Potential to Power Symposium was an amazing experience because I spoke to so many inspiring girls and women from across New York City, spent time with my awesome SPARK sister Katy, and delivered my first ever keynote! I had the opportunity to share who the 21st century American girl is, her aspirations, the obstacles she faces, and how women can be actively supportive in making her dreams a reality. I spoke about my personal journey that led me to identify as a feminist and how we must fight the negative, debilitating stereotypes girls face in the media. I said we must bring the cause of gender equity, equal representation, to the forefront because if you can’t see it, it’s near impossible to dream of achieving it. I told the girls in the room that our voices matter, that we are powerful individuals, and we can be even stronger together, united against the common challenges we face in America today. Lastly, I encouraged everyone in the room to expand their horizons by engaging someone of a different background in discussion because only through diverse collaborations can the best solutions for everyone emerge. It was a privilege to be given a platform to share my thoughts and experiences and to be the voice of the 21st century girl! The Symposium itself was a great event; my favorite part was the question and answer period after each panel where the amazing women and girls in the room asked thought-provoking, relatable questions to the panelists. Some of the great questions and answers that stuck with me include: How to educate conservative parents on your modern viewpoints without arguing with or disrespecting them? Or how to reconcile the fact that your religion has beautiful parts that you love but is patriarchal in nature and gives less power to women? It was so great that the YWCA provided a setting for the airing of these questions and panelists like Katy were so adept at giving great answers. 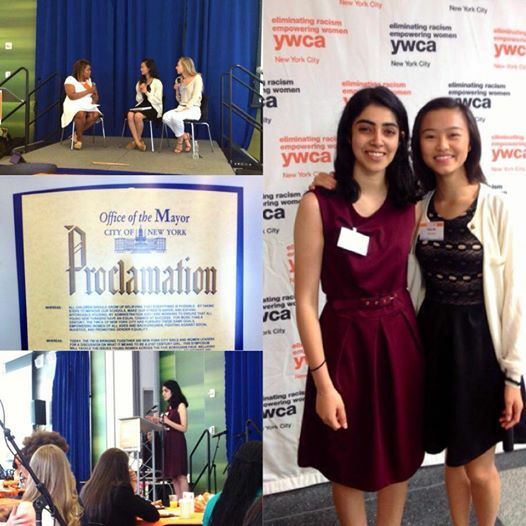 From giving my keynote to listen the NYC’s youth poet laureate, Ramya Ramana, recite Maya Angelou’s “Phenomenal Woman,” to meeting the “influencers” or successful women seated at my table, the first Potential to Power Symposium was an amazing day. I’m so glad that the proclamation from Mayor Bill de Blasio has made the symposium an annual event, I’m sure it will be even bigger and better next year!